Home » Google » What is a Google Keyword? What do people search on that match what you sell? Whatever that search term is, is the google keyword you want to optimise your website for. To start the process we recommend choosing four keywords and optimising four different pages on your site with one of these keywords to each page. Your first Google Keyword – your Business Name. The first google keyword you want to rank for is your Business Name. If your business name is Plympton Tax Accountant then that is your first keyword. Technically it’s a phrase, but it’s usually referred to as a keyword when talking about Search Engine Optimisation or SEO. Your business name will appear on your website several times so you should, within one month of your site going live, rank on page one on Google for this (if you don’t check with your web developer that they indexed your site with Google). Once you’ve achieved success in getting on page one for your own business name, turn your efforts to the next two or three search terms you feel would be best for your business. The head keyword is the hardest one to optimise for and will have the most competition. It is likely to be only one, or at most, two words. So if you are in the business of selling coffee, coffee is the head keyword. They’ll be lots of companies already ranking on page one for it. But start now and maybe in 2–3 years you can also rank for it. Longtail keywords are the easiest ones to optimise for and will have the least amount of competition. They’re likely to be 4 – 6 words in the phrase. Going back to our coffee example, a longtail keyword might be “best freshly brewed coffee in Adelaide” or “freshly roasted Brazilian bean coffee”. You won’t get as much traffic on the long tail keywords – but the traffic you do get will be very interested in the product you sell or the service you provide. Use longtail keywords that best describe your business, products or services and that people searching in Google or other search engines are likely to use. Before you decide upon your search terms, google them yourself and see what websites are already on page one for those two or three terms. This will give you some idea of how competitive the space is for those terms. It is valuable to do keyword research to begin with so you can find out the words that your customers and potential customers in their Google searches. Keyword research will let you know how many times phrases are used in searches. How many people are searching for the term in your area matters. If only 10 people are searching for the term, on average, a month, ranking well on that term may not get you the business you want. However if 100 or 1,000 people are searching for that term, and you’ve optimised your website for it, your business is likely to benefit. There’s a bunch of professional tools available to SEO experts. You can hire an SEO expert to find the perfect keyphrases for your business, or you can sign up to these tools yourself. However the tools, for example SEMrush, Moz and SERPs, can cost upwards of $50/month to subscribe to. If you’d like to do your own SEO and benefit from these valuable tools without ongoing costs and lock in contracts, contact us at DIY Digital about our Getting Started with SEO – Keyword Research Package. This package will get you started without any monthly fees or lock-in contracts. For a simple research option head over to Google Trends. Add in a Search Term. Add in a search term that you think you might use for your business. Wait for it to come up with the results. Then change the location to Australia and then add in another idea in the Comparison field. 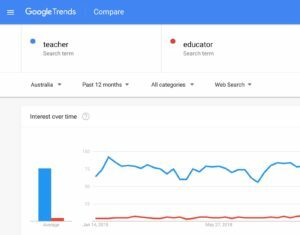 In this example you can see the word “teacher” gets a lot more searches than “educator.” It’s often the simplest, most straight-forward word or phrase that gets more searches. What-ever gets the most searches is likely to be your Google keyword. Once you’ve chosen your first keywords (or keyphrases) the next job is to make sure they appear on your website page several times, for example in the page heading, as an image title and in the text of the page. Knowing where to use them on your website takes time to learn and practice. Competitor businesses are also using similar phrases in their marketing efforts – so it will take effort and persistence to win with your chosen keyword. Keep the focus on one search term or google keyword per page. Don’t try to mix it up. For example, don’t have both ballroom dance shoes and latin dance shoes repeated on the one page and attempt to rank on both of those google keywords using that page. Have two different pages, one focussed on the search term Ballroom dance shoes and another focussed on Latin dance shoes. If you haven’t got the time, or you wish to benefit from professional expertise and the SEO tools, contact us at DIY Digital about our Getting Started with SEO Keyword Research Package. We’ll do the keyword research for you and then demonstrate to you how to use these on your webpages. Learn how to optimise your website with no lock-in contracts and no ongoing monthly fees.